Wakely Actuarial is an actuarial consulting firm based in Palm Harbor, FL specializing in senior, supplemental health, and life insurance markets. They had long relied on networking at trade shows and customer referrals for new business, and had a website that, as far as they knew, never produced a single lead. Sensing increased competition within the industry, Wakely Actuarial decided it was time to elevate their game with a new website and inbound marketing strategy. Wakely Actuarial came to Craft Impact in 2018 with a 15-year old website and a marketing plan that consisted of networking, conference attendance, and customer referrals. They had started to see their competitors incorporate email newsletters and blogging into their marketing arsenals, and didn’t want to fall behind. When asked if they felt that competition in their industry was growing, they answered, "definitely." Larger companies in the actuarial field were diversifying their consulting practices, and smaller consulting firms were increasing their digital marketing efforts to generate more leads and customers. But with a marketing staff of zero, they needed help putting their plan into action. One of the biggest challenges the company faced was how to clearly communicate their message to potential clients who aren’t as familiar with jargon-filled actuarial language. They also wanted to launch an inbound marketing strategy that would help grow their business and establish Wakely Actuarial as a trusted authority in actuarial consulting. "When we started working with Craft Impact, our only marketing plan was word of mouth and networking. In fact, our website content had not been significantly changed since at least 2003! Needless to say, we had ZERO experience in the digital marketing world. With Craft Impact’s help, we now have a website that is actively generating leads for us. We even started our first company blog! The Craft Impact team provides a personal level of service that helped us seamlessly transition to an inbound marketing vision and strategy that will be the future foundation of our company’s growth." 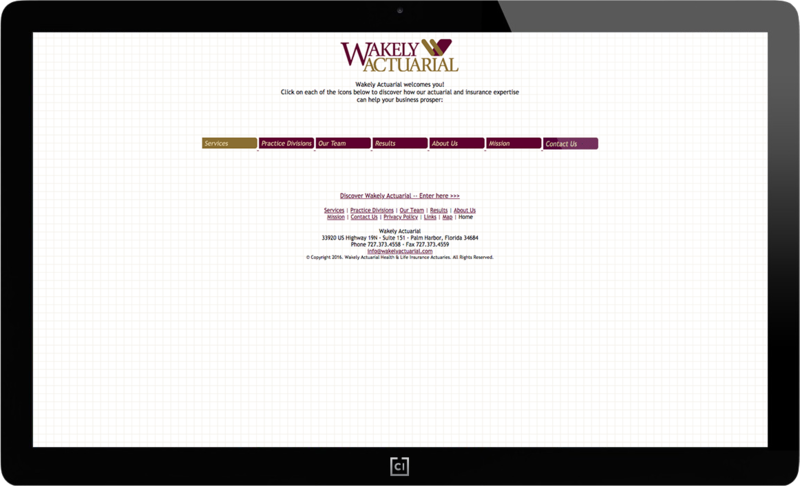 Despite having limited resources, Wakely Actuarial knew that the longer they put off updating their website and marketing strategy, the more they'd fall behind their competitors. Craft Impact’s team of inbound marketing specialists partnered with Wakely Actuarial to create a new website and develop a strong inbound marketing strategy that would help the company continue to grow. 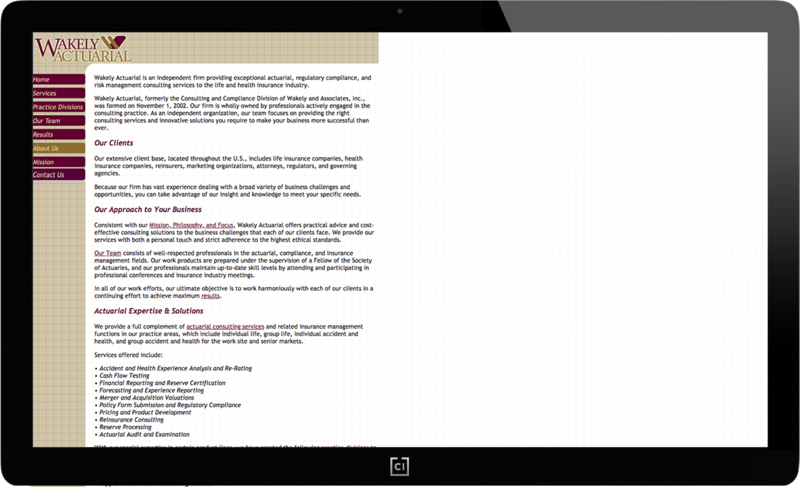 Step 1: Website Redesign. The Craft Impact team reviewed existing website content and researched competitor websites to develop an updated website that not only had a more modern look and feel, but would also help current and potential clients understand the services Wakely Actuarial offers and educate them on the actuarial industry in general. Technical language was simplified and turned into content that would resonate with potential buyers. Step 2: Implement a Sales Strategy. When Wakely Actuarial came to Craft Impact, their sales strategy included referrals and networking, but no central database to keep track of their prospects. Instead of disjointed, individual spreadsheets, Craft Impact worked with the company to implement a user-friendly CRM to log all sales activity and stay organized on following up with the contacts they want to stay in front of. Step 3: Launch an Inbound Marketing Plan. 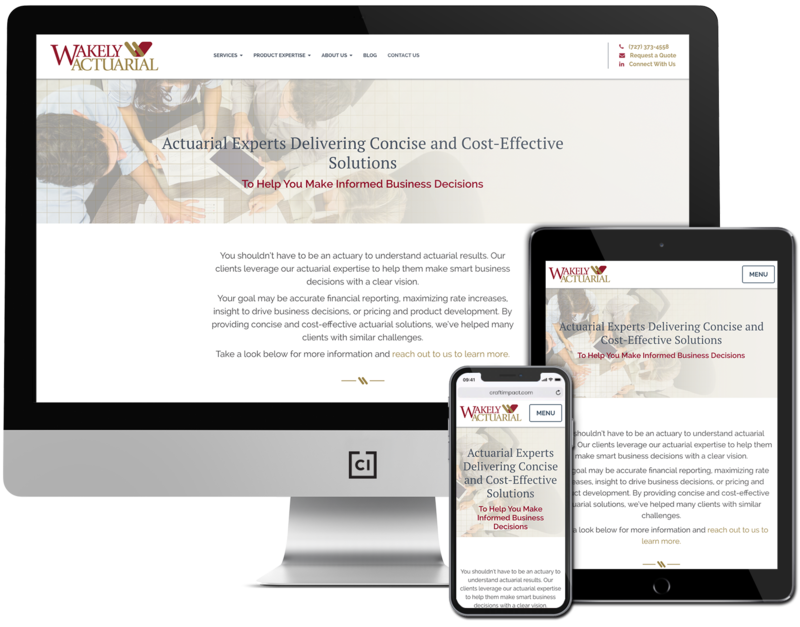 Craft Impact worked closely with Wakely Actuarial to devise an inbound marketing plan that was tailored to their needs, including blogging, email newsletters, conference communications, and social media. Research indicated that Wakely Actuarial's audience was most likely to engage with the company on LinkedIn, so their social media plan focused solely on this channel. Craft Impact helped optimize both company and employee pages and created a strategy for posting consistently and increasing engaged followers. 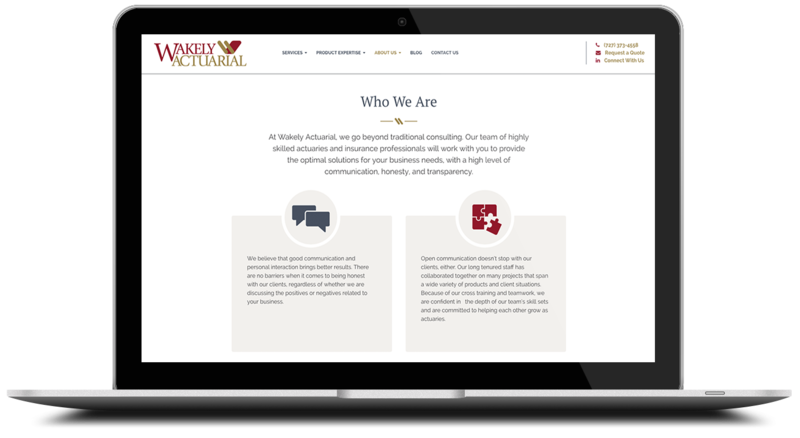 With professional B2B customers who have technical backgrounds, it was important to convey credibility, professionalism, and trust on the Wakely Actuarial website. Redesigning their site with simplified, clearer content helped to more easily communicate that message to potential buyers and current clients. Starting an inbound marketing plan from scratch is a lot like turning the Titanic, but within the first couple weeks of launching their site, Wakely Actuarial started to receive leads from people completing the “Contact Us” form on their site. Within the first month, the team was scheduling meetings with potential clients who were able to contact them via the website.